There’s been a growing concern about the way credit card offers are marketed to consumers. While there have been no cases of misrepresentation, per se, there is a growing frustration with the technicalities associated with today’s financial verbiage. We thought we’d look around and see what exactly is going on and whether these concerns are warranted. Here’s what we found. One of the bigger complaints these days focuses on the words and advertising lingo found on envelopes. How many “pay no interest for the next two years” have you seen on envelopes addressed to you recently? Plenty of big, bold fonts in vibrant colors, right? Open the envelope and read the fine print and what you might find is anything but a guaranteed no interest credit card for the next two years. What you might find instead is, “Pay as low as no interest for up to two years”. Ah…those additional words change the meaning in its entirety. That’s why it’s so important to read the small print. Most advertising efforts are focused on the benefits and not so much the pitfalls of some offers. Too many times, we get wrapped up in an offer for a balance transfer card and the fifteen months of no interest we’ll pay. What we might miss is that 0% APR is for balance transfers only and we might end up with a higher APR on our purchases than any credit card we’re currently carrying (which, if you think about it, sort of defeats the purpose, right?) Also, don’t forget the annual fees! That first year waived fee is great – until the $195 fee comes due in eleven months. The point is to assume nothing – read the fine print and read it again. Also, another tried and true trick many credit card companies and perhaps more notably car dealerships are the words “Everyone is approved to apply”. That doesn’t mean you’ve been pre-approved for a loan or credit card – it just means you’re free to apply for that loan. HUGE difference – especially when it’s your credit scores at stake. An invitation to apply is just that – inviting you to sign your name on the dotted line of a credit application. And if you’ve been preselected? That’s all fine and good – as long as you know it really means the company bought your name and address from another company and because of that, you were preselected to apply for whatever the latest credit card offer is. 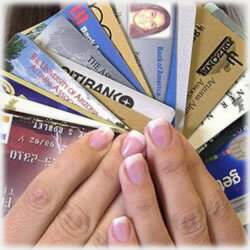 Another misconception many people have about business credit cards is that you have to jump through hoops to get one. You don’t; in fact, even sole proprietorships that typically don’t have Tax ID Numbers can still qualify with their social security numbers. That’s not to say everyone should run out and apply for a business card if they can’t qualify for a consumer credit card. First, there are laws in some states that prohibit that and serious repercussions if you’re caught using a business card as an individual. Still, small business owners like the idea of having a card with their company name on them. It adds authenticity to the brand they’re building. That said, and this is where some get confused – especially if you’re using your social security number in lieu of a tax id number – you still have to get approval and it can be as tough and sometimes tougher in those situations. So just because you have an eBay shop, don’t assume it’s easier to take the business card route when an individual credit card account would better serve your purposes. Do your comparison shopping. Like the idea that the latest credit card offer you received promises no liability for fraudulent purchases? It’s a selling point some card companies use, but you should know you’re protected via several laws if someone steals your card or information and uses it illegally. It’s great that a card company strives to protect you and your identity, but it’s a feature every credit card has. Under the Fair Credit Billing Act, you’re liable for no more than $50 charged to your credit card by illegal methods. These days, most credit card companies don’t even hold their customers liable for that. And if the credit card or bank’s website is breached, you have no liability at all. We often present to our readers great intro bonuses for new account holders. But we also take great responsibility in ensuring we explain any other details that are attached to those sign up bonuses. For instance, many credit card offers come with a $100 cash back bonus after your first purchase. Often, those first purchases have a minimum amount and other times, it may be the cash back or bonus miles come only after you spend a specific amount, say, in the first ninety days. That’s important to know since you don’t want to spend a dollar just to get a nickel back. It’s a great benefit, but only if you need it. So pay attention to those details as well and do the math. What might be a great deal for you may be a burden to the next cardholder. You may have heard in recent months about the fantastic Capital One offer from last year. Everyone wants to know when they’re going to run another promo, since so many weren’t able to take advantage of it. So good was it, that even Capital One was surprised by the level of excitement. The Double Mile Challenge offered customers who signed up for the Venture card double miles for every dollar spent on the competition’s travel rewards card. How amazing that was for so many consumers. The problem was, Capital One was nearing the one billion mile mark and knew it had to pull the plug, so a month into it, the promotion ended. It may be we begin to see more fantastic offers like these – the trick is making sure you hit the promotion before it’s a has-been. Ultimately, it all comes down to first understanding what the terms and conditions are for any financial product and next, making sure it’s still a great offer after you’re past those terms and conditions. Not sure about the way something reads? Call the card company. Their customer service teams are there for a reason.